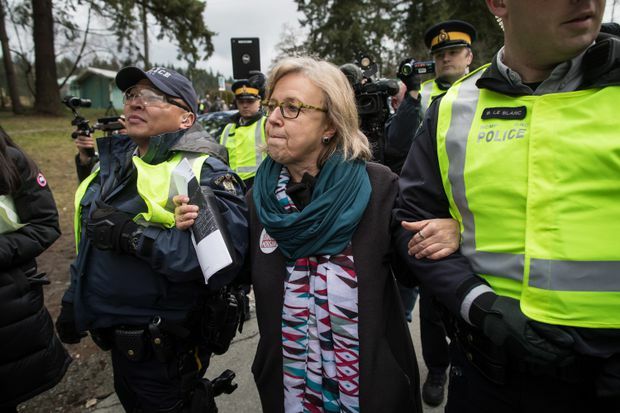 Federal Green Party Leader Elizabeth May, centre, is arrested by RCMP officers after joining protesters outside Kinder Morgan's facility in Burnaby, B.C., on March 23, 2018. Green Leader Elizabeth May pleaded guilty to a criminal contempt of court charge Monday, moments before a British Columbia Supreme Court judge said the MP exploited her position to encourage others to also break the law by violating his injunction at a Kinder Morgan work site. Justice Kenneth Affleck said May is also a lawyer and therefore had a responsibility to obey his order and to persuade others to do so. Affleck issued an injunction more than two months ago preventing people from protesting within five metres of two work sites in Burnaby. On Monday, Affleck said his order preserved the right to peaceful, lawful and safe protests but May, 63, chose to protest at a main gate to Kinder Morgan’s pipeline terminal, where she was arrested. New Democrat MP Kennedy Stewart, who was arrested with May as they protested with about 100 others, pleaded guilty to criminal contempt of court two weeks ago. He paid a $500 fine, but said later he did not regret his actions. May’s lawyer, Alex Ejsmont, apologized to the court on his client’s behalf and proposed a fine of $500. However, Affleck said May’s punishment had to be greater than it was for others who do not hold positions of authority. He ordered her to pay a $1,500 fine. May said outside court she respects the judge’s decision that she should face a stiffer fine but believes non-violent civil disobedience has a place in a functioning democracy. May said she will reassure her constituents in the Vancouver Island riding that she was not charged with a Criminal Code offence. “I’m not a convicted criminal. This is a common law offence under an unusual provision around enforcement of private injunctions,” she said, adding her role as an MP is not affected by her guilty plea. May paused and looked at her lawyer before saying she would not repeat her actions, though she vowed to keep up her fight against the pipeline expansion. Kinder Morgan has set a deadline for Thursday to decide if it has enough certainty to proceed with the twinning of its existing pipeline from Edmonton to Burnaby. May said she expects the company to cancel the controversial project that the federal government approved in the national interest. Finance Minister Bill Morneau has said the federal government is prepared to protect the Trans Mountain project against financial loss by using public money. British Columbia Premier John Horgan opposes the expansion, while Alberta Premier Rachel Notley has said her province would buy the project if that’s what it takes to get it built. Dozens of anti-pipeline protesters have been arrested. About two dozen of them were in court with May on Monday to deal with their own cases.